Dame Maggie Smith Becomes A Companion of Honour! She’s already a Dame but Maggie Smith, Downton Abbey’s incomparable Dowager Countess of Grantham, has received an even bigger honor from The Queen. 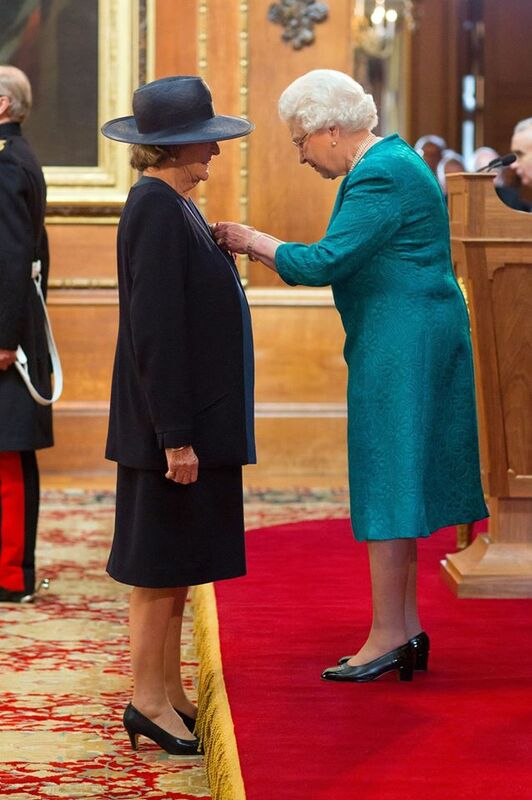 At an investiture ceremony at Windsor Castle earlier today, Dame Maggie was honored with the Insignia of a Companion of Honour in recognition of her impressive six-decade career! Dame Maggie was appointed Dame Commander of the Order of the British Empire (DBE) in 1990. Companion of Honour is one of Britain’s highest awards and one of its most elite groups. According to The British Monarchy website, The Order consists of the Sovereign and 65 ordinary members. Dame Maggie joins fellow Thespians, Dame Judi Dench and Sir Ian McKellen and other Companions including Professor Stephen Hawking. It carries no title but recipients may add a “CH” after their name. The Order of the Companions of Honour was instituted in 1917 by George V at the same time as the Order of the British Empire was founded, and it is sometimes regarded as a junior class of the Order of Merit. It is conferred on men and women for recognised services of national importance. Foreigners are admitted only as honorary members and certain additional members are appointed by statute in commemoration of special occasions. Other recipients include painter Lucian Freud, naturalist Sir David Attenborough, painter David Hockney, historian Dr Eric Hobsbawm, politicians Sir John Major and Lord Patten of Barnes, General John de Chastelain, dramatist Harold Pinter, conductor Sir Charles Mackerras, the Reverend Chad Varah, and scientist Professor Anthony Pawson. The Order’s badge is a gold oval-shaped medallion with a representation of an oak tree. Hanging from a branch is a shield of the Royal Arms, and on the right of it is a representation of a knight in armour mounted on a horse. 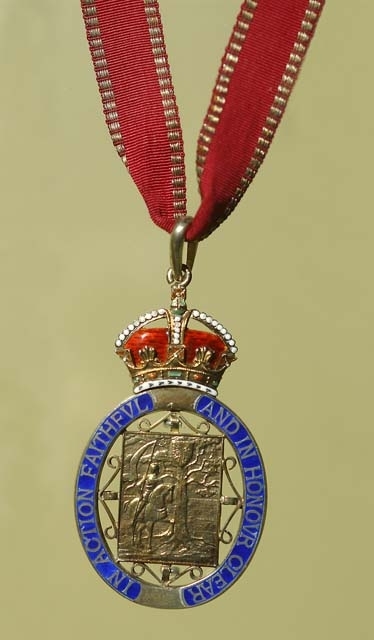 The badge, surmounted by an imperial crown, has a blue-enamelled border bearing the motto of the Order, ‘In action faithful and in honour clear’. 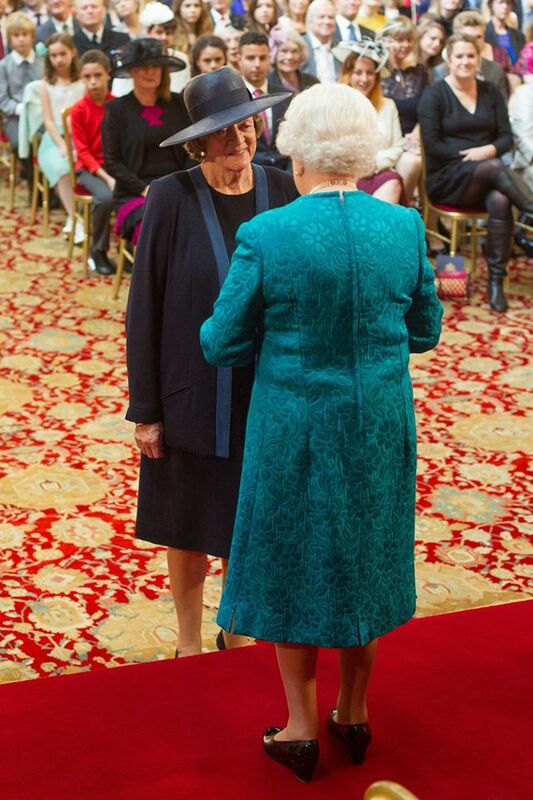 Watch Dame Maggie’s Companion of Honour presentation here. It brings tears to my eyes! Congratulations Dame Maggie Smith (CH). Lady Anglophile…fantasizing about one’s own Damehood. 1 Response to Dame Maggie Smith Becomes A Companion of Honour!